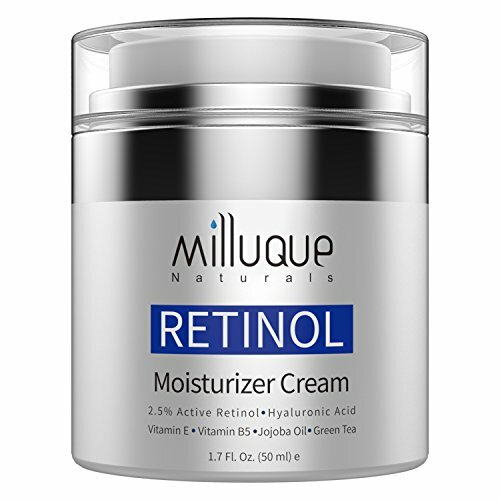 Retinol Cream Face Moisturizer, Day and Night Cream, Anti Aging and Anti Wrinkle, with 2.5% Active Retinol, Hyaluronic Acid & Vitamin E.
The seller is no longer offering vouchers. Retinol is a form of Vitamin A, an ingredient that promotes skin renewal and enhances collagen production . As well as lessening the appearance of fine lines and wrinkles. Adding a retinol cream to your skincare routine has been proven to not only reduce fine lines and wrinkles, but also help prevent them forming. 71% Organic, natural ingredients such as Hyaluronic Acid, Vitamin E, Green Tea, Vitamin B5, Shea Butter, Jojoba Oil. Strictly and Responsibly selected materials to guarantee all the ingreindients can provide the best results. Used as day and night cream anti aging. Use sunscrenn daily as Retinol increases sun sensitivity. Discontinue use if irritation or allergic reaction. If you are pregnant or nursing, consult your physician. Contains no harmful chemicals, preservatives, artificial fragrances or dyes. Free from parabens, petrochemicals, SLS/SLES, PEGs, synthetic colours, perfume or additives. Always at your service, as you are the one we invited to enjoy beauty & life together!